Veterans across the US will be able to see medical information from participating institutions -- including the VA -- organized into one view all in the Health app. VA patients will get a single, integrated snapshot of their health profile including information on allergies, conditions, immunizations, lab results, medications, procedures and vitals, and is displayed along with other information in the Health app like Apple Watch data. "We have great admiration for veterans, and we're proud to bring a solution like Health Records on iPhone to the veteran community," said Apple CEO Tim Cook. "It's truly an honor to contribute to the improved healthcare of America's heroes." AppleInsider will be testing the integration with the feature and the VA's systems as soon as possible. It isn't clear how long the deployment of the feature will take, as the VA presently relies on a combination of digital records, and paper records going back decades -- with the records sometimes spanning multiple facilities and duty stations. ... and next the general public ... can't wait to move my health records into the 21st century in the US (from the 19th!). The cynic in me suspects the VA will shortly be in a position of "be careful what you ask for" with regard to medical records. It might reveal some things they'd rather not be known about the standard of care in VA hospitals across the country. On the other hand, if it improves the quality of care veterans are receiving, I'm all for it. Disclaimer: I am a veteran who eschews the VA in favor of my employer's health care, which, even though it costs more, is miles and miles better than the VA. Already here, my provider was part pf the initiative about a year ago. I have pieces of my record at three different facilities for different reasons, and getting the trio to talk is problematic at best, and a total shitshow at worst. I'm skeptical how well this is going to work, how complete it will be, and am very concerned about how long it will all take. Same issue here. It would be great if Health could import the info that I can already see from three different services. I already can see it and download it. I just need a way for me to pull it into Health without any cooperation from the three different databases. Same here, especially the eschewing the VA for my own health provider. The quality of VA care is uneven at best and shameful at worst. Many vets I've know didn't have that option and had to rely on the VA. For most of them, it wasn't pretty. Is there an accessible list of the Health Care providers that are supporting/supported? I saw somewhere that Kaiser Oregon Is a participant -- but nothing about Kaiser Northern California. But we've got to start somewhere. I particularly am excited that private industry (especially Apple) rather the various Federal, State, Local governments and agencies is driving this effort! This is already happening. My medical provider is part of the pilot program last year, so my test results and other data go into the HealthKit API and show up in the Health app. The data follows me, not my provider. So if I go elsewhere I have it. If the next provider uses HK it is added to my data reservoir. Makes me unhappy whenever I hear a comment like this. I am firmly of the opinion that veterans deserve the best standard of care and access to the best healthcare in general. Not a veteran myself, just thankful for the service. Hopefully this will be very different from the original efforts the VA took to launch EMR services across the VA network. Eh, veterans got paid a salary and career path for their service, it’s not charity work. Plenty of low-paid government workers and low-paid researchers in science. I’d hate to say any one group is more deserving of better medicare care than another. One could argue that everyone living in a prosperous society with the best medical technology on the planet and huge army of caregivers at its disposal deserves adequate medical care regardless of the circumstances of their service or employment. However, equating military service to being just another "job" is shortsighted and misinformed. It's not like the CEO of Starbucks can order his employees into harms way based on a political whim and imprison those who do not comply. Military service members cannot quit, unlike civilian law enforcement who also face serious personal safety and well being risks, because they don't like the terms of their employment, are uncomfortable with the risks, or because a competitor offers them a higher salary. Military service members are subject to a parallel system of laws and justice that does not apply to non-service members, while also being subject to all of the civil laws and justice system that non-service members have to abide by. There is no doubt that the all-volunteer force has fundamentally changed the social dynamic in the enlisted ranks and the role of military service as an employment option for unwealthy kids. Military service does serve in a similar capacity as civilian government service as a hedge against the massive unemployment that would otherwise exist in a purely capitalistic society. But there is still a huge gap between what society expects from military service members versus what it expects from those who labor away in similarly low paid civilian jobs. However, if the US had a comprehensive health care program for all citizens we wouldn't even be having a conversation about whether access to basic health care should or should not be treated as a "reward" system for any one group of citizens over any other group of citizens. It would be nice to recognize veterans for their service in ways other than trying to frame substandard government provided health care as a supposed "reward" system for veterans when the VA system itself is more geared towards serving political, pork barrel, and bureaucratic interests rather than the veterans themselves. In other words, those who served as pawns for other people's self interests while serving in the military basically assume the same role when they attain veteran status. As a nurse, I can assure you that your FIRST concern should be the accuracy and completeness of the data. If you have any significant level of interaction with the healthcare system, I can assure that your record is far from accurate. So, why would you want to propagate and distribute these inaccuracies? The main benefit of this though is to let the patient see his medical records (even though he will see only a selected subset of them -- they are not his records but the property of the provider and the provider still decides what the patient will see and what he doesn't see). But, meanwhile, the complete record will have already been sent to any new providers you interact with. 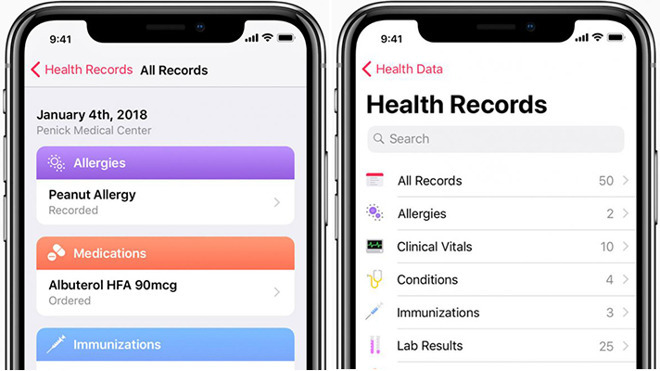 Yes, Apple is doing a good thing making these records available to the patient. But they are doing nothing to improve the deficiencies inherent in the system. But one can hope that patients actually seeing their records, even if it's incomplete, will start to show some of those deficiencies and get them corrected. However, ever cynical, I believe it's more likely the providers will restrict what the user sees even more, or shut down the program completely, with some excuse about it not working, or people being confused about the data. I don't like this collaboration AT ALL! I am not a fan of Apple as they brag about not being able to be hacked yet they were and tried to sweep it under the carpet a few years back until it became so public they had to admit it. The VA while it has an older system, is working with health information specialists and the DoD on integrating the entire system from the DoD to all VAs on a much better integrated health platform. Right now every VA CAN access other VA information very easily if they aren't lazy. It is a special program that allows access. Each VA location can see other VA locations records on patients as well as DoD medical records. Anyone who tells you they can't ...well I'll leave it there so I don't get in trouble. It's not a perfect system and yes takes some looking around on occasion to find what you need but it is there. What the VA has now is more secure than letting Apple have access to records. I hope for the best for veterans that choose to use this feature, I for one won't ever trust Apple. My only Apple product is an iPod and it will still that way. Technology can be a great thing and I get that everyone wants immediate access to everything but with that can come a cost. I'll be interested to see how secure this feature really is. I am currently in a HIMS course now and this has come up in discussions. I'm not certain what you're talking about? The celebrity photo thefts were social engineering, not a systemic hack. If you've spent your military career in one locale or command, you're right, it is easy for VA information to promulgate. However, if you have a multi-year and multi-command career spanning a large geographic area, it is anything but easy, and takes a great deal of persistence to get all of the information out of the system. You're welcome to not trust Apple, but putting your faith in the federal system with the myriad breaches that they've had of OPM data which were actually hacks and miscreants taking advantage of lax IT security seems myopic.